I use this ready-to-go lesson as a larger part of a middle or high school social studies lesson on diversity. 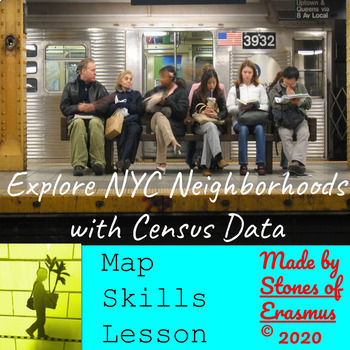 Using data compiled by the 2010 United States Census and The New York Times, you and your students can look more closely at the neighborhoods of New York City to see how they're changing. Which neighborhood is the most diverse? Which neighborhood is the least diverse? Which areas have the highest concentration of ethnic minorities? How have ethnic communities in the city, including Dominican, Puerto Rican, Pakistani, Bangladeshi, Chinese, Indian and others grown or declined? 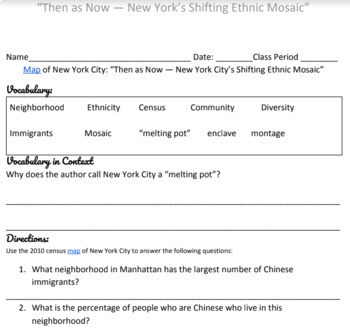 1 persistent Link to the New York Times Article "Then as Now — New York’s Shifting Ethnic Mosaic". For other resources using maps and geography check out my popular resource on geography awareness using a blank world map. Extra: Navigate your web browser to my website to follow me on my journey. Note on copyrighted materials referenced in this resource: This resource does not contain any copyrighted material from the New York Times. However, URLs from the Times is hyperlinked in this resource. 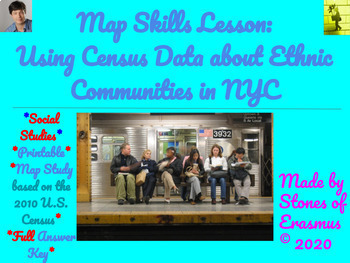 This resource does not reflect the opinions of the New York Times or of the U.S. Census nor is it meant to be an official analysis of census data. This resource is purely intended for educational purposes only.